It all began for me on February 11, 2010, with an email from Phoenix Landing, telling me of 26 birds several volunteers had picked up from the Catawba County Animal Shelter in North Carolina. They were what were “left over” from 142 that had been confiscated by Animal Control on December 16th, 2009. These two dozen plus birds had quite literally reached their last day, for if it had not been for the Herculean efforts of Teri Rand, Lannie Ellison and other Phoenix Landing volunteers, these innocent creatures might have faced euthanasia. The majority of the group were Amazons, and on the spot I volunteered to foster a pair of Lilac Crowns that were on the list. I was told that they still needed to be cleared medically. Of course, common sense, right? No problem, I just wanted to help, I’d be ready when they were. I packed a big box of toys and shipped them down for all the birds to share. Then the photos came in. Have you fallen in love from a photo? Well here’s the one that did me in. This little bird had not yet been named, so I suggested Winnie, and everyone agreed. I couldn’t get this little face out of my mind, and asked if once cleared to move, could she come to live with me too? Yes, and she had a cage mate who had been named Eeyore, would I take that one as well? Could I really handle 4 new Amazons? Ooops, misunderstanding, Eeyore was one of the Lilacs, the other Lilac, Darlene was living with a Blue Front, Kittredge. So, deep breath, I’d take Winnie & her friend Eeyore to foster, just the 2. More toys and food heading south. Then the sad news. Of the original 142, a few of the birds had died soon after going to the shelter. A stressful environment like that can really test a bird’s immune system, but there was some concern for disease as well. However, once the birds came to Phoenix Landing under the care of Teri & Lannie, they began to thrive! Focusing on medical care, quality nutrition, and lots of physical and mental enrichment, the birds rallied in body and spirit day by day. However, given their checkered and negligent background, the search for foster homes with no other parrots began. Phoenix Landing wanted to insure that other birds were not put at risk until we could insure that the shelter birds were in proven good health. This meant that Winnie & Eeyore could not come to live with me. Well that kind of a home, a parrot-less home in search of a parrot, is very hard to find. In addition to the their medical workups, the birds were also tested for the Bornavirus, thought by some to be a cause of PDD, a disease that has no sure cure. 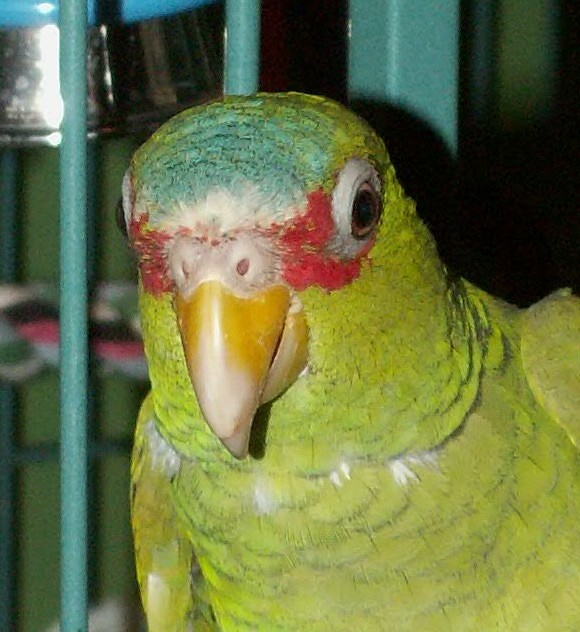 Several of the shelter birds tested positive for Bornavirus. Now I must diverge from the story in Hickory for a moment, to let you know a little about my experience with Bornavirus & PDD. A couple of years ago, our macaw, Trixie, was exposed, second-hand, to PDD, which of course threw me into a panic. I went frantically searching for everything I could find out about PDD, which honestly wasn’t much at the time, but it was thought to have a fairly short incubation period. The best thing I could do for Trixie was to boost her immune system, because PDD seems to primarily strike birds who’s health is otherwise compromised. Time goes by and Trixie is still just fine! Then I was fostering Jesse, and with her initial intake blood work, my vet regularly runs a test for Bornavirus, as part of a research study her office is doing. Jesse came back positive. Well, what did that mean exactly? Bornavirus is thought by some to be an indicator for PDD, in that to date all birds diagnosed with PDD are also positive for Bornavirus. But that does not mean that all Bornavirus positive birds will get PDD. 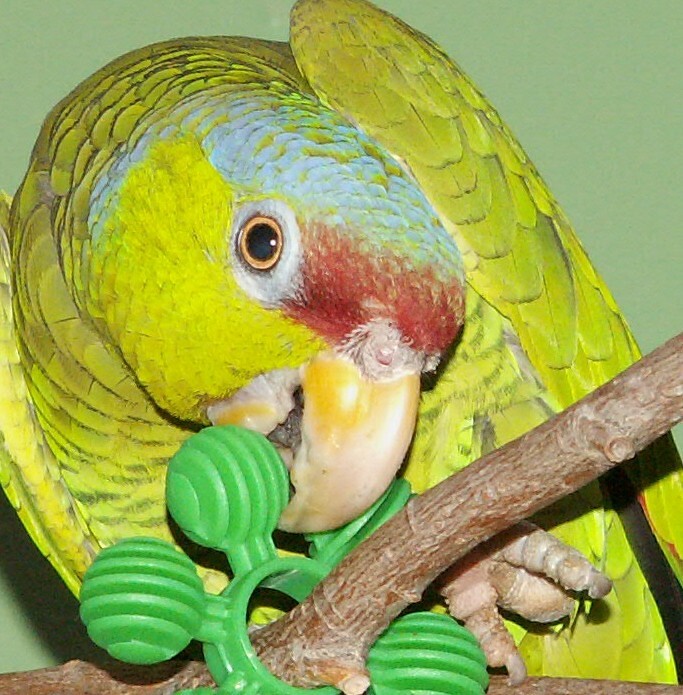 Current estimates are that 40% of ALL parrots have Bornavirus, but less than 20% of those will ever show any symptoms of PDD, which can now be treated with anti-inflammatory drugs. PDD has been found to be inflammation in the bird’s brain that causes loss of vision, digestive malfunction and other neurological disorders, so it should no longer be considered a fatal disease. But how do birds get Bornavirus? Still not sure, but there are several cases of pairs of birds (mates) with one being treated for active PDD, and it’s mate still tests negative for Bornavirus, so some acclaimed avian vets believe that birds with Bornavirus are actually born with it. So I had Trixie and our Amazon, Ariel tested too. Ariel is negative, but Trixie is positive. So regardless of how the virus is transmitted, it’s in my home (and if you have more than 1 bird, probably in yours too). Now back to Winnie & Eeyore, when I was told that they both tested positive for Bornavirus, for me it was a “been there, done that”, moment, no big deal, I could just do for them what I had done for Jesse and was still doing for Trixie, which means a diet high in immune system support, and anti- inflammatory foods. After a couple of months of ever improving health, Ann (Founder of Phoenix Landing) decided that the Catawba shelter birds could be fostered or adopted in homes that also had other parrots. But, if I took Winnie & Eeyore, it was for adoption, not to foster. My husband and I discussed this, and agreed, that these two little girls had been through enough, and yes we would make the commitment together to do what was necessary to incorporate them into our family. But I had one condition, Eeyore’s name needed to be changed, for that was not a name for a little bird who always looks like she’s smiling. She was renamed Ella. So preparations began to bring Winnie & Ella, the ‘WE’ girls as they came to be called, home. I was already scheduled to teach a class in Asheville on April 15, so I made plans to go down a little early and let the girls get to know me, then bring them home with me at the end of the weekend. My friend Beth offered to make the drive down with me, so we packed my car full of baskets and toys and toys making supplies for the group, and drove 8 ½ hours south. When Beth and I arrived at the facility in Hickory what we saw truly amazed us. It was a bright and cheerful room, with floor to ceiling windows, birds playing in cages with lots of well chewed toys, chattering back to each other, even “peek-a-boo’s” bouncing back and forth across the room. All but one, the shy Darlene, happily (and gently) took treats from us, total strangers. Their feathers glowed and eyes sparkled. Sandy, the Double Yellow Headed Amazon, even accepted a scratch from Beth. These were happy engaged birds! Not what we were expecting for birds who had been so recently rescued for a truly horrid situation, and to think how close these precious creatures had come to death, nearly brought us to tears. Over the past few weeks Winnie & Ella have settled into our home very well, craving as much attention as Matt & I can give them, verbally interacting with Ariel & Trixie, and growing more self confident daily. They passed their vet check with flying colors, Dr Ho was amazed at how healthy these girls are, especially considering their background. I have absolutely not the tiniest doubt that adding them to our family was the right choice to make! The joy they have for life completely overflows out of the windows of our home! This entry was posted in Adoptable Birds, Parrot Health & Safety. Bookmark the permalink. What a heartwarming story, Laura! It so wonderful that you are able to give the “WE” girls a place to land, especially given the hardships they’ve experienced. If we choose to live under constant fear of something dreadful happening, then we sure do miss out on a lot of life. Way to boldly take the leap! I’m as sure as you are that this was meant to be. Thanks so much for sharing your beautiful story. What beautiful birds! You can see the intelligence just shining from their eyes. I’m so glad they have a loving home. Thank you for the wonderful story. Can you share your special bird diet for the positive Borna Virus birds…we just found out our Pi has it. Thanks! Have a Macaw with positive bornavirus titer. He is 37 and was brought back from Panama when my husband was stationed there in 1975. He is currently taking Celebrex and supportive nutrition supplements. What food would you suggest to boost his immune system. He was hospitalized 4 weeks ago with regurgitation and weight loss.. he is home now..does not pass undigested food in his feces. He is a scarlet macaw always a little on the aggressive side..this behavior has returned so i feel he is at least maintaining..what info can you give me? Our daily routine starts with my getting him up at 8:30 AM..he sleeps in a padded large pet carrier in our bathroom which is in our master bedroom ..we have a heater in the bathroom to maintain a warm temperature..he sleeps for 12 hours every night . he eats very little during the day..i have a 2 hour face to face session with him every morning offering him various foods..including his favorite..corn on the cobb pasta pistachios. raw almonds blueberries. black berries. He goes back in his cage in the sunshine until 2 PM when i try to feed him again. He’s up until 4 or 5 depending on how successful i am at his 2 o”clock feeding..
when i put he in a pet carrier with a heating pad to give him a power nap until about 6 when he actually eats a good amount of seeds and his fruits and veggies. I put him to bed at 8:30 PM. If you have any suggestions about what i can do ..please let me know!